The worlds first certified organic and fair trade chocolate bar, Coco Loco tantalize with vegan and vegetarian sweet treats and cocktails in a jazz inspired decor. Due to high prices and a competitive Northcote dining scene, the restaurant and bar is relatively off the radar. I have often walked past on a busy Saturday night perplexed at why it was so vacant. The chocolatier, Khalid Sherbini opened up Coco Loco to carry on his families chocolate recipes from Africa and Europe, where his family ran a chocolate bar in Berlin and cooked for the royals in Egypt. The layout is reminiscent of a 1920s jazz bar, dark and brooding, minimal lighting and dark wood surfaces. The staff are always super friendly, and great to chat to. 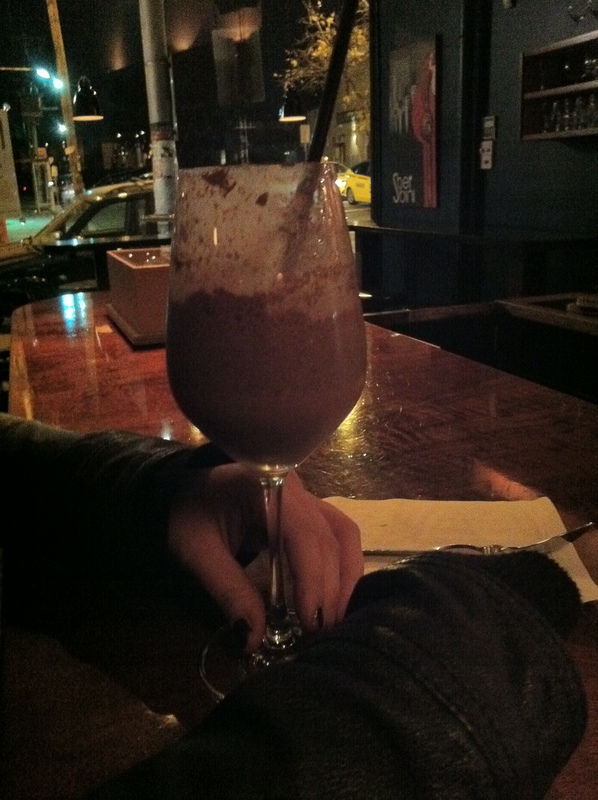 I have never eaten a meal here, however I am addicted to their infamous liquid chocolate drinks. What I love about this place is the choice. When ordering a chocolate drink, you can choose the type of chocolate, the intensity, type of milk, additions and liqueurs. My favourite is the ‘Marquis de chocolat’ (Pure 70% chocolate). I chose ‘Kashew Mylk’, served deep, iced, with a shot of French dark chocolate liqueur and a scoop of their cherry and dark chocolate gelato. This, for me, is unadulterated pleasure. Coco Loco creates their own cashew milk, which complements their chocolate drinks without overpowering the flavours. This time I tried the Paramour (Vanilla chocolate) with the additions as mentioned, minus the gelato. Mr M, tried the old faithful River-mint chocolate. The aroma hits my nose well before it has been served. The scent of chocolate is salivating. Both drinks meet my expectations, light yet creamy, with a hint of vanilla and mint. 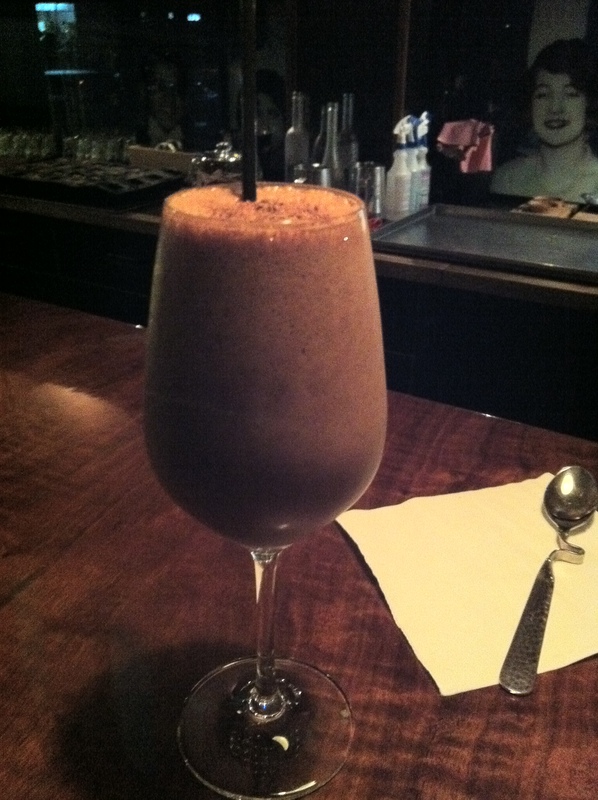 The shaved chocolate on the top of the drink is a welcome addition. I prefer the vanilla chocolate, as the mint is not dominant enough. Both are light on the stomach because of the ‘Kashew mylk’. 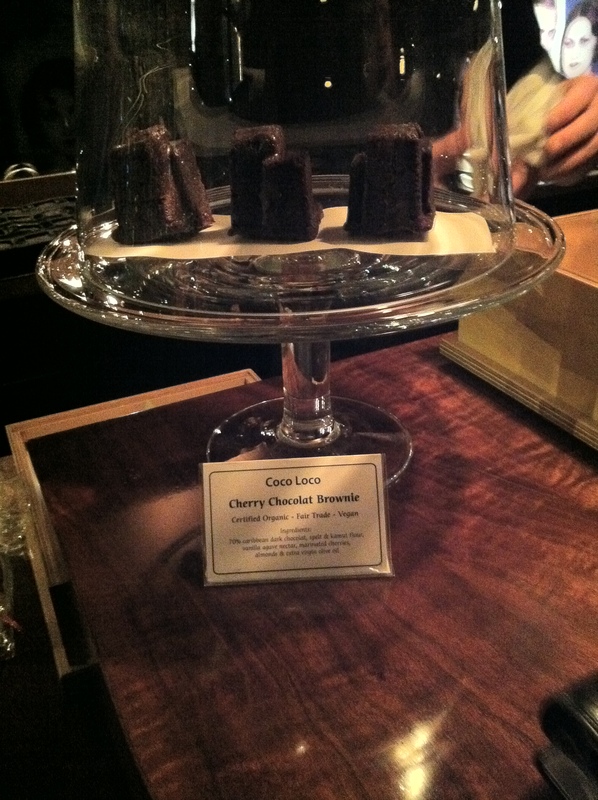 During our drink, Sherbini finished making a batch of chocolate cherry brownies. The brownies are set in a futuristic mould in the shape of a rectangular geometric block, which looked like a cityscape. Sherbini describes the brownie as: ‘his superannuation package’. I wasn’t sure how to take this information, but felt compelled to purchase this brownie which obviously represented so much of the chocolatiers sweat, blood and tears. The appearance of the brownie is not the only thing modern about this brownie. 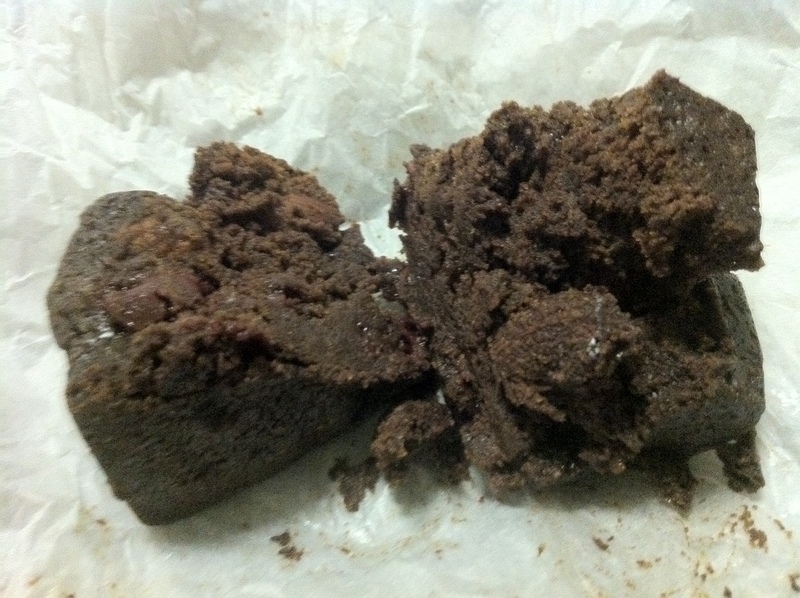 Sherbini makes the brownie without the use of baking soda or self-raising flour. Using spelt and kamut flour instead. Sherbini has spent years perfecting the recipe without the use of any raising ingredients. The treat is incredibly dense and full flavoured. The cherry matches perfectly with the coverture chocolate. I dislike nuts in brownies, however traditional it may be. I would suggest he leave out the almonds. It distracts from the chocolate, and the serving size is too small to contain nuts. The natural ingredients used ensure that you are not left feeling sickly full. This time I missed out on their cherry chocolate gelato, which is arguably one of the best in Melbourne. The question is whether they can survive and revive their popularity amongst diners, so that Sherbini can carry on perfecting his love of chocolate. From previous reviews I have read, the main issue has always been price, which is why I believe they are not as popular as they could be. It’s a reality for small business owners to raise the retail price of products because the wholesale cost is so great. I also percieve that Sherbini will not skimp on quality in order to drop retail prices. I loved this place for the drinks and dessert, the only hurdle is the price. Sherbini plans to soon go wholesale, keep your eyes peeled for his masterpieces in food shops, restaurants and cafe’s in the coming year. A lovely organic treat without any guilt added…. ← Product review: Gundowring ice cream.